We really want you to get the rewards you deserve. That’s why we’ve made earning Trade Points really easy. To get you started, we’ll give you a welcome gift of 500 points, preloaded onto your account when you register. Now, every time you go shopping for supplies, show your Trade Points card. 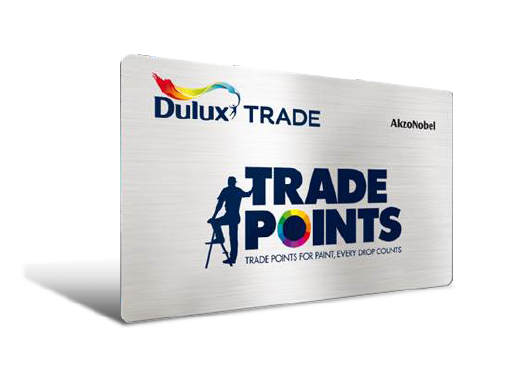 You’ll earn one Trade Point for every single euro you spend on Dulux products. But it gets even better… because you’ll also get points for buying other AkzoNobel products, including Cuprinol, PolyCell, Hammerite, Armstead and Sikkens. We’ll also have special monthly deals that can earn you double or triple points on certain products. Check here on the Trade Points website for updates, and keep a lookout when you’re in-store. Trade Points can also be earned simply by coming along to the trade events we host from time to time, and by taking part in the testing and reviewing of new Dulux products. Keep your Trade Points card handy at all times, or download the app, so you’ll never miss the chance to pick up the points that’ll get you closer to the reward you want.